And the Dove Came in to Him…. Most religions start with some kind of revelation. Some guy while walking in the woods finds golden plates, next thing you know, two scmucks are knocking on your door asking strange questions. An old man walks to the top of the mountain, comes down with a couple of stone tablets, next thing you know I have to feel bad about eating bacon. A guy gets crucified, next thing you know…. I may be on to something too. 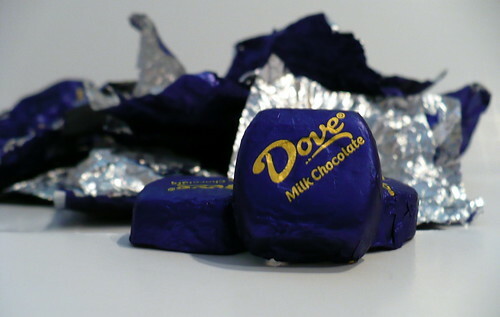 Lately, I started noticing that Dove Chocolate Promises contain unlimited supply of chocolate wisdom and life directives. After eating several bags of chocolates I now have enough wrappers to cover most of life’s questions and daily matters. The Promises can be divided into two categories: wisdom and directives. See, it’s like a higher power telling you what to do. OK, I am back from my “special place” where I just “discovered myself” and I am “smiling” so “people will wonder what I’ve been up to”. Get it? I am on my quest to eat more Dove Promises to finally discover the secret of life. I found out that I can actually order my own Promises with old stand-by’s like “don’t pee against the wind” or “don’t eat yellow snow”.